All future Forza Motorsport games will include Porsche cars at launch, the franchise’s creative director has confirmed on Twitter. Last week, Microsoft and Porsche announced a multi-project partnership for the racing series. “By having Microsoft as our partner, we have the opportunity to take the pleasure of driving a Porsche and making it an experience in the virtual world”, said Detlev von Platen, Member of the Executive Board responsible for Sales and Marketing at Porsche AG. “Racing games and esports connect the real and virtual worlds and enable us to gain further access to the young target group. It means that they can develop a passion for Porsche even before buying their first sports car”. Details about the premium partnership were shared in an official post on the Xbox Wire, but the article didn’t really mention what the collaboration would bring for future Forza games. Luckily, the franchise’s creative director, Dan Greenawalt, has now confirmed that Porsche cars will be featured in all future Forza Motorsport games. 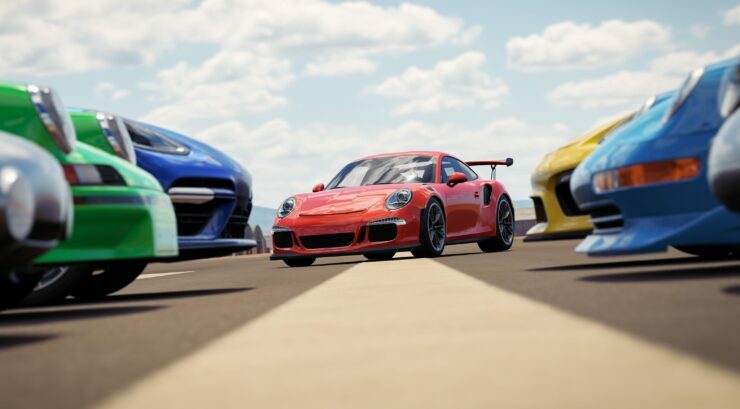 “With this partnership we are cleared and excited to include Porsche models as part of future @forzamotorsport titles at launch”, Greenawalt said. Porsche is one of the most recognized racing car brands in the world, and models have been present in the Forza franchise since the original Forza Motorsport, but were absent in Forza Motorsport 5. The German motorsport cars were made available as post-launch content for Forza Motorsport 4, Forza Horizon 2, Forza Horizon 3, and the recent Forza Motorsport 6. Turn 10 is currently working hard on Forza Motorsport 7, which was prematurely announced by a racing wheel manufacturer last year. The game will likely push for native 4K resolution on Microsoft’s upcoming Project Scorpio which is slated for a release later this year. Microsoft will be unveiling the console in full during its E3 press briefing this June, and a limited number of fans will be allowed exclusive early-access to Xbox exclusive and Project Scorpio during the Xbox E3 2017 FanFest.